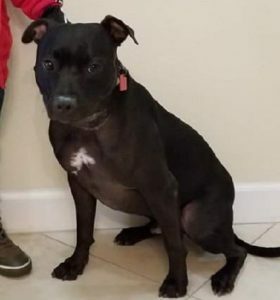 Loki is a 2 year old Black Lab / Pitt mix. He’s about 45lbs of pure muscle, but not a mean bone in his body. He’s a sweetheart, loves people, kids, and other dogs. He has a ton of energy, likes to go on jogs or play fetch in a big yard. He is house trained and likes to cuddle up in bed. Loki will need some help with seperation anxiety. He does not like being caged. His rabies shots are good for three years. Loki’s humans are unable to give him the care he deserves – his mom is out of town for a series of surgeries and his dad is traveling for work most of the time.